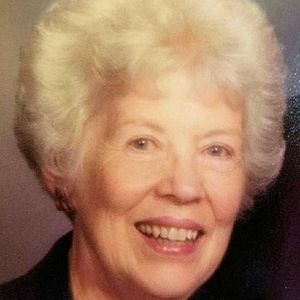 Arlene Meyers Jaffke, 89, passed away Friday, March 22, 2019 at Heritage Woods in Yorkville. Arlene was born and raised in Aurora and graduated with honors from West Aurora High School in 1947. She married W.W. "Jeff" Jaffke in 1949 and had three children, Lauren, Bryan and Leigh Ann. She was dedicated to her family and the business that she and Jeff started until their retirement. Arlene loved good food, especially sweets and had a smile for everyone. She was a lifelong member of Wesley United Methodist Church. Arlene is survived by her daughter, Lauren (John Suter) Jaffke; son, Bryan (Emily) Jaffke as well as several grandchildren, nieces and nephews. She was preceded in death by her husband, brother and most recently her daughter, Leigh Ann. Visitation will be held on Wednesday, March 27, 2019 form 4 PM – 8 PM at The Healy Chapel, 332 W. Downer Pl., Aurora, IL 60506. Funeral services will be held at 11 AM on Thursday, March 28, 2019 at the funeral home. Burial will be private. Add your thoughts, prayers or a condolence to Arlene's guestbook.